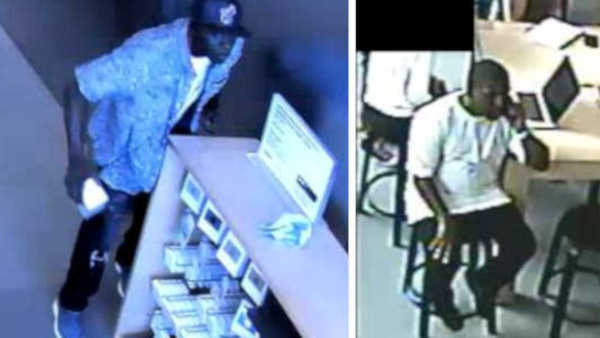 NEW YORK (WABC) -- Police are searching for two suspects who robbed Apple Stores in Manhattan. Police say the suspect walked into the Apple Store on West 14th Street and stole 3 iPhones. Just over an hour later, he and a second suspect allegedly stole 19 iPhones from the Apple Store on Prince Street. Both robberies happened on the afternoon of June 1st. Anyone with information in regards to these incidents is asked to call the NYPD's Crime Stoppers Hotline at 1-800-577-TIPS (8477) or for Spanish, 1-888-57-PISTA (74782).